Ouno Design » Faceted Curtain vs. Magnetic Curtain – copycat? « Destroy all foreign sauces! Faceted Curtain vs. Magnetic Curtain – copycat? Many people will have probably seen the Magnetic Curtain designed in 2008 by Florian Kräutli. His curtain is not in production yet but will soon be available through Droog Design. Its function is simple – it’s raised, lowered or pulled aside by manually accordioning its magnetic nodes together or apart. It remains in whichever configuration you push it into. 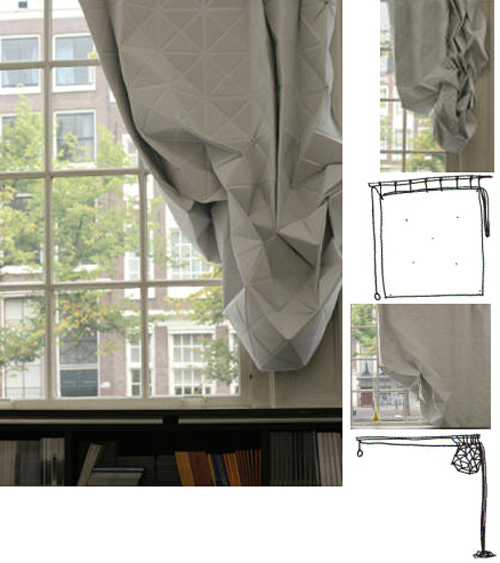 In a recent post on this curtain in the mocoloco design blog, many readers commented that the curtain seemed very reminiscent of an earlier design by Hannah Allijns, a faceted geometric curtain that works via drawstrings rather than magnets but that otherwise looks very similar (below). Allijns’ curtain was featured on design*sponge in early 2007. Her curtain, too, is now in production and will soon be available. Both curtains are interesting, but the question is, is Florian Kräutli’s magnetic curtain a ripoff, a deliberate homage, or just a fluke? While simultaneous, unrelated design inventions do sometimes occur, these two items do seem awfully similar, but does that mean anything? Two things come to mind: first, similar design ideas do often arise around the same time in history, and many have theorized reasons for the zeitgeist effect. Secondly, designers are definitely inspired/influenced by things they see around them, consciously or unconsciously. As a designer it’s easy to find yourself on both sides of this problem. We’re sure that every designer has had ideas scooped at least once – or wonders if he or she has. A similar theft/imitation/fluke happened to us last year, and it was hard to know if it was deliberate or just a funny coincidence. As for the curtains themselves, many people seem to prefer Allijns’ curtain, aesthetically speaking. We like both of them. I love the use of magnets, though I’d prefer magnets in any colour but gold. Black? Silver? White? This entry was posted on Friday, January 2nd, 2009 at 7:23 pm	and is filed under design. You can follow any responses to this entry through the RSS 2.0 feed. You can leave a response, or trackback from your own site. When developing the magnetic curtain I was busy actually with a project inspired by the book “Hertzian Tales” from Anthony Dunne. I asked myself how an interior would look if it is not structured by visible light, as it is usually, but by the non-visible spectrum of the electromagnetic fields. So I also tried to develop materials that are made through these fields or other invisible forces (magnetism, microwave). I made some samples using iron filings, epoxy and magnets. I could model the filings along the field lines of the magnetic field and through the epoxy it remained stable even after removing the magnets. Inspired by that, I wanted to make something that adopts a three-dimensional shape under the influence of an electromagnet. It would be a flat structure, which when turned on, turns 3D. As I found out, electromagnets are too weak and slow for that, so I went a much more manual way. I wanted to make a textile that can be shaped by hand and, through magnets, holds its shape. That’s how I developed the magnetic curtain. So.. who knows coincidence? or not. I am just excited to see any designer exploring window coverings period, we so lack innovation in that segment of the design industry.